Being overtaken by a car is stressful for cyclists. The reason is that many drivers don’t even know what distance should be kept during this manoeuvre. 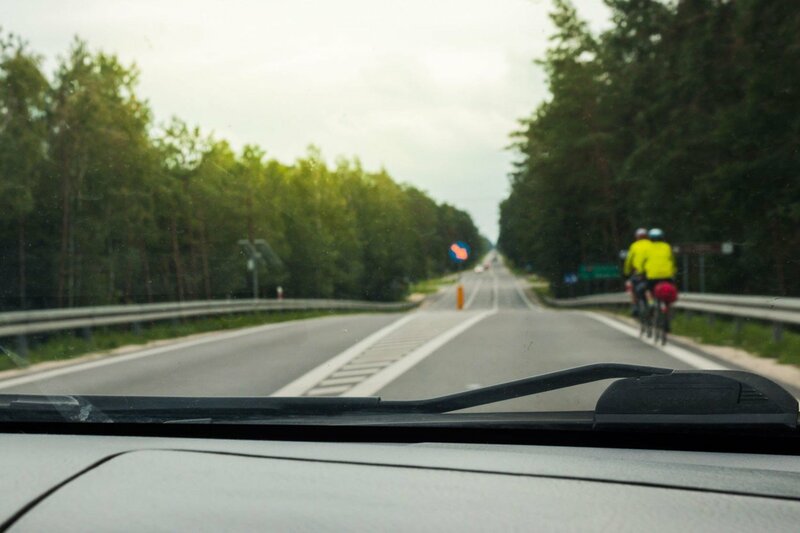 According to the statistics of ŠKODA Auto, if the driver leaves only a little free space, 40% of cyclists consider such a manoeuvre to be dangerous. When overtaken by a lorry or a bus, 61% or nearly two thirds of riders are afraid. What can be done about it and how do you overtake safely? As a general rule, drivers must not overtake if it would compromise the safety of other road users. As this can be interpreted in various ways, some countries, such as Spain, Belgium, France, and Australia, have laws or regulations setting a minimum distance to be kept while overtaking. In fact, most drivers are sensible people who pass cyclists with caution, be it because of the law, or because they realize how scary it is when a rear-view mirror almost touches your handlebars. Let alone if you face wind gusts or need to avoid a sewer, losing precious centimetres between you and the car. Some drivers are impatient. If they encounter a cyclist in a blind corner, they don’t want to slow down and wait for a more suitable section of the road to overtake the cyclist at a greater distance. That’s why they decide to overtake them in a bend or bottleneck. The only thing cyclists can do to prevent this is keeping to the centre of the road in such places. It’s therefore important that drivers know that it’s not a sign of arrogance or an attempt to get in their way. A study published in Queensland, Australia, in 2010 showed that even though drivers tend to consider cyclists to be the black sheep of traffic, records on accidents do not prove this theory. The study looked at 6,774 cycling accidents registered between 2000 and 2008. Cyclists were the party at fault in less than a half of the cases, more specifically they were to blame in 44.4% of the accidents. The bigger portion of cycling accidents was caused by motorists. According to a study by the University of Adelaide, 79% of collisions between cars and cyclists were the fault of drivers. The British department for transport gives similar figures (60-75%). – Cyclists would have enough space for avoiding obstacles, such as potholes, glass, etc. Sometimes drivers don’t really know how to overtake correctly. Robert Šťastný from Škoda Auto’s Traffic Safety Research advises drivers to always keep a distance of 1.5 metres. “A traffic lane is about 3 metres wide, so 1.5 metres is roughly a half of its width. 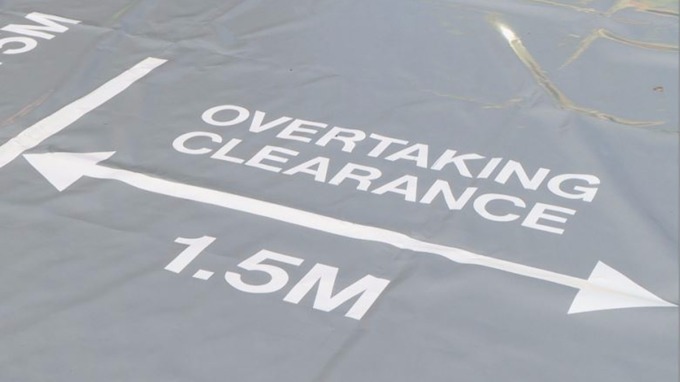 If cyclists themselves need an additional 1.5 metres, and the car is 2 metres in width, then the driver won’t fit in their traffic lane when overtaking a cyclist. Despite that, drivers often do overtake like this. Personally, I always seek to overtake a cyclist in the same way I overtake a car – by going entirely in the opposite direction,” says Robert Šťastný. He recommends extra caution if the car tows a trailer wider than the car itself – such as a caravan. “What can happen then is that the car avoids the cyclist, but the trailer hits them. Such a collision is even worse than a crash with a car because there is a risk that the cyclist will fall under the wheels,” warns Šťastný and adds that when turning, the rear corner of the trailer considerably drifts to the side, posing a significant threat for cyclists, which is why the distance must be even greater than the generally recommended minimum of 1.5 metres. Safe overtaking is not just a question of a precisely calculated distance, it’s far and foremost a question of mutual respect between individual road users. According to Jiří Polomis from Czech traffic safety organization BESIP, this aspect is even more important in countries where there’s not enough space for dividing different modes of transport into separated lanes, e.g. roadways for cars and cycle paths for cyclists. “With respect to traffic safety, I always underline the importance of shared space. In an ideal situation, this should involve an occasional role change. Drivers should sometimes take bike rides in places where there is car traffic to experience what it feels like to be brushed by a passing vehicle,” Jiří Polomis explains. What he considers to be the most problematic is clearly oriented groups – such as a car user who mostly acts as a driver and only occasionally as a pedestrian in the traffic, and perceives the space accordingly. The situation is similar with other groups of users of various modes of transport. “These are the roots of unpleasant collision situations in which road users blame each other,” Jiří Polomis explains. Most countries include considerate behaviour in their legal regulations, which usually state that every road user is obliged to act in a considerate and disciplined way, without limiting other road users or compromising their safety. So far, we’ve discussed mainly the obligations of drivers, but cyclists too can contribute to easy and safe overtaking. According to Robert Šťastný from Škoda Auto, the first criterion is that cyclists should be visible from a distance. If the driver notices the cyclist in time, they can better plan their overtaking manoeuvre than if they spot the cyclist at the last moment. Drivers can have a torrid time if they have to overtake a bigger group. “When a peloton is too long, it’s advisable to divide it into several parts, leaving enough space for a car in between them in order to enable the driver to interrupt the overtaking manoeuvre,” says Robert Šťastný. Cyclists in a peloton should keep a safe distance from each other because even a minor collision among them can have tragic consequences when the peloton is being overtaken by a car. Both drivers and cyclists can show good will on the road. If a car is approaching a biker from behind and the side of the road is clearly free of obstacles, the cyclist can ride closer to the side to let the driver know that they know about them and will be happy to let them pass. Of course, this is not always possible, as sometimes the condition of the shoulder of the road doesn’t allow for safe biking. A nice and useful form of communication with the driver can be used when the car catches up with the cyclist before a bend. The cyclist who can already see what happens in the bend can signal to the driver behind them that there are no oncoming cars and it’s safe to overtake. This is a question of a very fragile trust. If the driver believes the cyclist that the road is free, and something unexpected happens, the driver will be suspected of overtaking without being able to check if the road is clear and make sure that the manoeuvre won’t put the cyclist in danger. Anyway, every encounter of a car and a bike is always more pleasant with smiles and waving hands than with honking and angry gestures. Mutual understanding and respect are our most important common goal.